It’s sad when retired carnival rides go unsold or are broken up for parts. We can only hope the old cars find an appreciative new home. For $3,500, you can spin yourself silly in this restored Skydiver ride car being offered by Neven + Neven Moderne, an art dealer in Hudson, New York. “Has wheels (not attached), for moving. Can be mounted to spin, or can sit on wheels,” according to the item’s description. Produced from 1965 to 1979 by Chance Manufacturing, the Skydiver was a Ferris wheel-like ride whose cars were equipped with a steering wheel that let riders do barrel rolls. It’s considered a classic by ride aficionados but very few parks and carnivals have Skydivers nowadays. During its heyday, state fair midways featured as many as three Skydivers in a row for the flash. 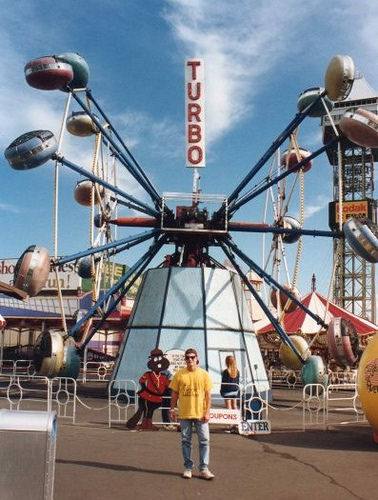 Coney Island had a Skydiver as well as Chance’s one and only double Skydiver, called the Tumbler. Both rides were owned and operated by the McCullough family, who had rides in Coney Island for more than 50 years. 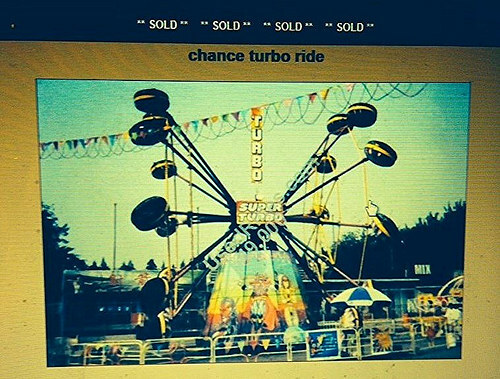 If you want to ride, you can still find a Skydiver at Lakemont Park in Pennsylvania, Silverwood in Idaho, and at fairs played by the traveling carnivals Christiansen Amusements, Campy’s Amusements and Powers Great American Midway.